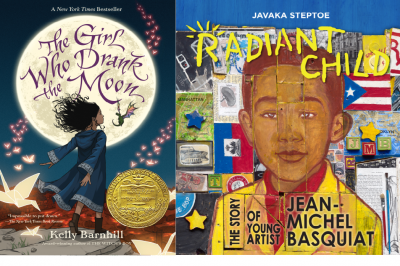 In the US, the American Library Association (ALA), has announced the winners of its Youth Media Awards, including the Newbery and Caldecott medals, and the Printz and Stonewall awards. Kelly Barnhill’s The Girl Who Drank the Moon (Algonquin Books of Chapel Hill US) was awarded the 2017 John Newbery Medal for most distinguished contribution to children’s literature. The 2017 Randolph Caldecott Medal for the the most distinguished picture book went to author and illustrator Javaka Steptoe for Radiant Child: The Story of Jean-Michel Basquiat (Little, Brown). March: Book Three (John Lewis, Andrew Aydin, and Nate Powell, Top Shelf) was the winner of the Michael L Printz Award for excellence in young adult literature, as well as three other prizes: Robert F. Sibert Award for the most distinguished informational book for children; the Coretta Scott King Author award; and the YALSA Award for Excellence in Nonfiction for Young Adults. The Stonewall Book Award for books on lesbian, gay, bisexual and transgender experience went to Magnus Chase and the Gods of Asgard: The Hammer of Thor (Rick Riordan, Puffin). Winners in all categories of the youth media awards, and a list of honour books in each category, are available on the ALA website here. The awards were announced at the ALA Midwinter Meeting and Exhibits, which was held in Atlanta, Georgia.